Anna Banana and her band of stuffed animals are back! And this time, they are hungry. Anna Banana and the Chocolate Explosion starts off with Pingpong, the penguin, who is as hungry as a bear. And he wants chocolate cake. Of course things get out of control, and quickly. 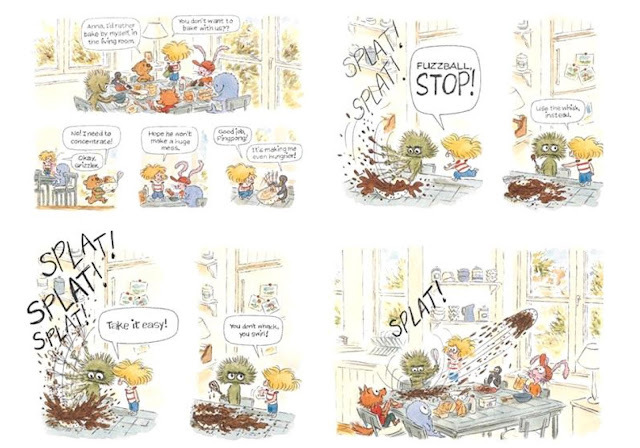 My favorite spread, below, finds Fuzzball energetically, if not efficiently (or cleanly) stirring the batter with verve. Meanwhile, Pingpong is still hungry. Fortunately, Grizzler has headed into a different room to bake, alone. Intrigued by his process, they sneak after him when he retreats to bake another cake . . .
Only to discover that Grizzler has been visiting the bakery! 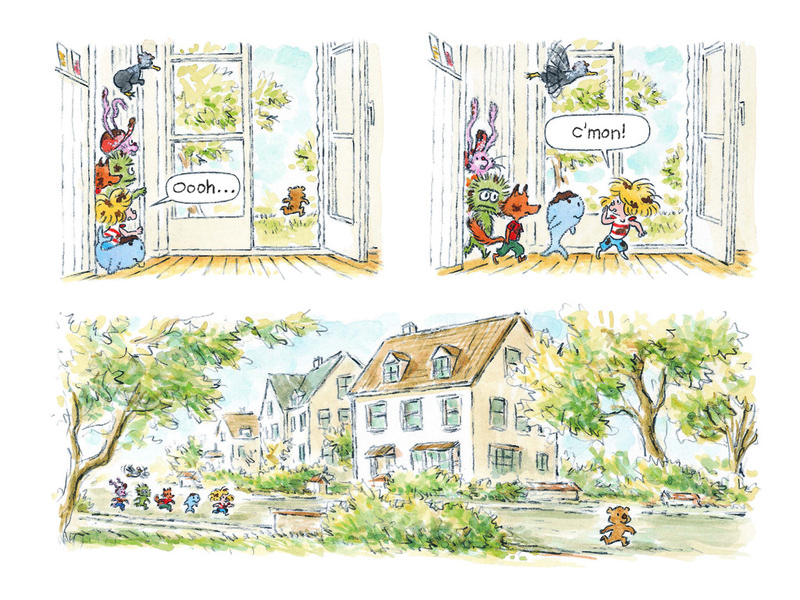 They all head back to Anna Banana's idyllic house on a tree lined street where they manage to scrape some batter into a pan and bake another cake. 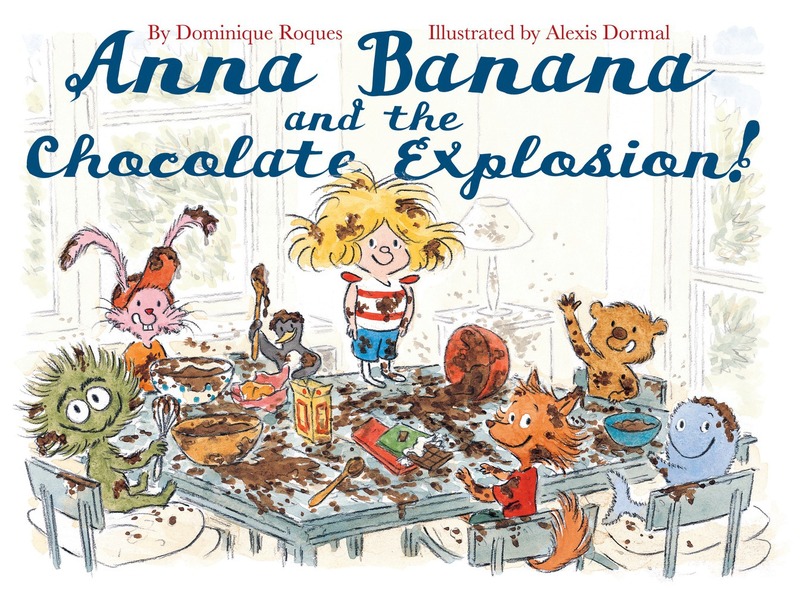 The comic book format of Anna Banana and the Chocolate Explosion makes the action all the more expressive and the expressions of the characters even more hilarious. Anna and her gang are completely endearing and reminiscent of the Muppets. 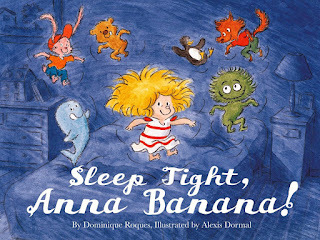 I love this format and hope that there are more picture books like it on the way, and more from Anna Banana and the gang! Love the comic book format! What a fun story. 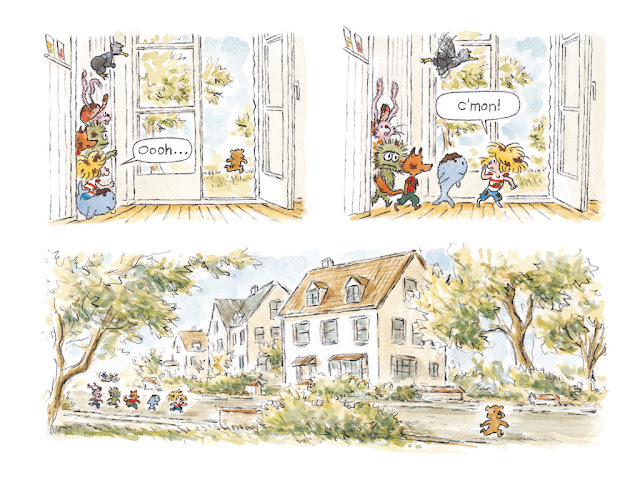 The illustrations are fabulous. Thanks so much for sharing.